The thinner the better! This girl’s back tattoo includes the simplest of star tattoos, inked in a thin black outline. 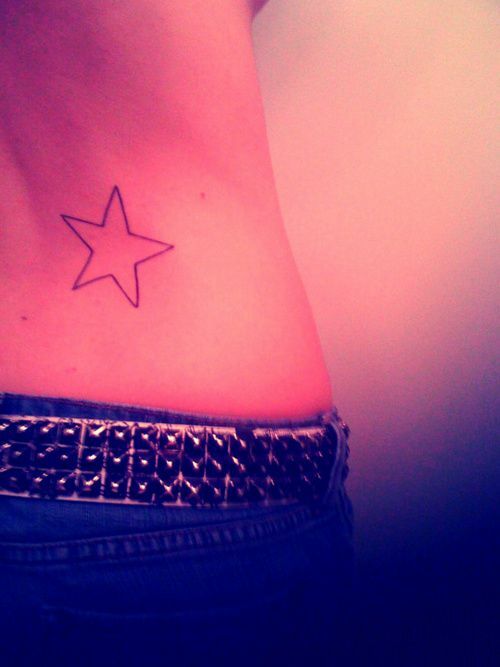 The perfect addition to this girl’s studded belt is her simple outlined star tattoo. The small star tat is inked in a thin black outline on her lower back, on the right side of her waist. Although some people might say this back tattoo looks incomplete, we think it’s the perfect type of star tattoo design for girls. Depending on their style, some girls shoot for ornate star tattoos, while others prefer the simplistic design of star tattoos like this girl’s. Some of the most common star tattoo designs that women get inked on their bodies these days include stars and moons, shooting stars and nautical stars.